When it snows, I can hardly wait to get out to the woods or to other natural areas just to see the record left by different critters as tracks. For instance, yesterday at the Overland Park Arboretum I was wishing I had my normal camera along to record some of the tracks. I saw bobcat tracks trailing along downed logs, coyote tracks on the ice and countless deer tracks. Those are not my tracks. I con my students to follow me around doing lots of things but I don’t think many would have been up for such an activity before school officially starts back up. It was too cold, yesterday for shrews on the surface–I imagine they prefer the subnivian habitat on such days. Still, I stopped by the arboretum to check out the tracks and the bird feeding stations. No shrew tracks (or reasonable facsimiles) but there were a number of off-trail human tracks in the area. Did you our your students get out there Eric? In taking the time to look for the caption to the image link I posted, I discovered that all those tracks were not from “Blarina” although that is what I had google image searched (blarina tracks). As the caption says, they are, from left to right, from Blarina in the snow, Deermouse, Meadow Mouse, and Masked Shrew. It was a question though not a statement and asked based on the evidence I had at hand. 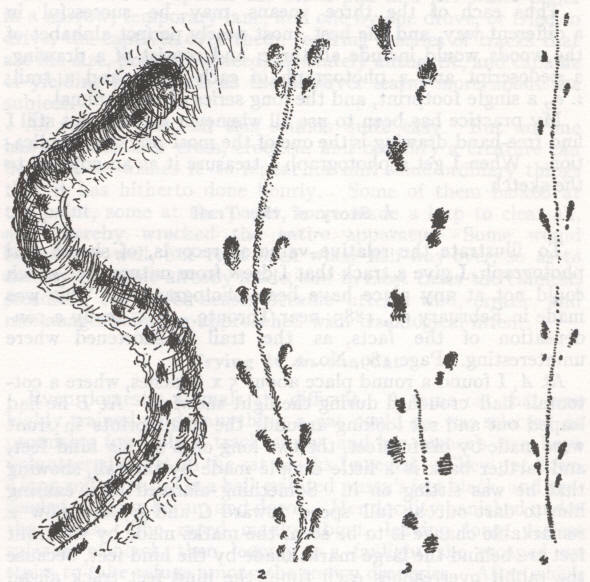 As you will still see along the beginning of the Blarina track sketch that I posted, there is still a line between the first four foot prints (assumed to be produced by a tail and not dragging of the feet in some manner – and assuming that the sketch was done by a credible observer). Are you sure your observations (memory) aren’t being clouded by your expectations based on the common name of the animal? I think short in this case is a relative term. The images I find using google suggest that this animal could potentially produce a tail line. Wiki says the tails range from 0.7 to 1.3 inches in length. Thus, how could a 1.3 inch tail not make a mark in the snow? You aren’t going to see a tail line on a Blarina—they are called short-tailed shrews for a reason. Good hypothesis, Eric……any ideas of other evidence that would help you be more certain? I have to agree, based on these images. In fact, based on the size and all, I would say this is a Blarina sp. btw, Shrews are plantigrade (flat-footed). No attempts at the challenge? Hmmm….. perhaps another hint….. There were other tracks that I did not photograph—in a tell-tale 2 x 2 pattern–that mostly eliminates the mouse possibilities. This is one neat critter for NE KS. BTW, I went back out to the Arboretum, yesterday and the network of track sign now covers about 1.5 acres.